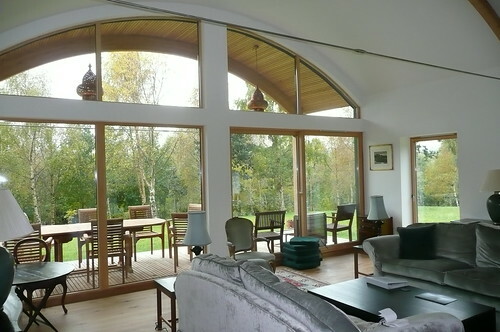 Home of Alexander and Vinny Burnett, Kashentroch is an elegant and well designed open plan timber frame house in a beautiful setting close to the Dee. The original part of the house (with the pitched roof on the right of the picture), built about 5 years ago, has recently had an addition of a spacious living area with a vaulted roof. The house is highly insulated using Warmcell and considerable care has gone into ensuring air tightnessA measure of how leaky a building is to air. In other words, how draughty it might be. There are now standard fan pressure tests to check how air tight a house is and the Building Regulations have minimum standards for all new houses (L1A – Conservation of fuel and power in new dwellings (England)). A much higher degree of air tightness is covered by the Passivhaus standard. Space heatingthe heating of the rooms as opposed to the heating of the domestic hot water. See Space heating and Domestic hot water is by a wood pellet stove and domestic hot water is heated by a combination of solar panels and the stove. Velux solar panels are also incorporated although Velux have since ceased making this product. Triple glazing. The living room has a wide spanning barrel vault roof. Note the elegant steel tie bars which restrain the laminated roof arches. 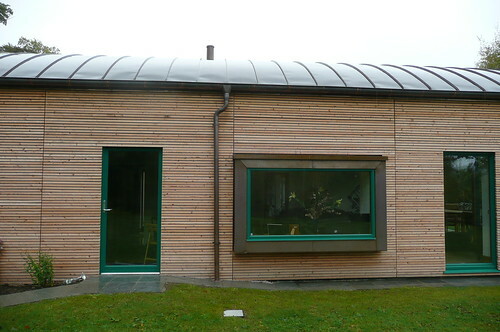 One of the most interesting aspects of this house is the way that the external cladding, a larch rain screenthis is a (usually thin) outer cladding on a wall which prevents rain, snow, etc getting at the structure of the wall behind. see more on rain screen, has been designed to reflect a modern cool aesthetic, avoiding the somewhat rustic appearance which shiplap or board-on-board cladding sometimes evokes. See more on the aesthetics of timber. Same question as above – love this house! Curious to know approx costs of a project like this as I want to self-build and am looking into timber structures/Segar Method. Any guide on costs for consideration would be appreciated. Love this house! How much does a house like this cost to build…? And is it easy to get planning permission…?